The Eurasian Siskin (Carduelis spinus) has a northern palearktisk distribution and occurs from Ireland in the west and as far east as Japan. It is partly migratory and wintering as far south as the Mediterranean and China. During the winter the bird lives mainly of seed, and also eat the seeds of the herb and grass vegetation, and insects. TAGS: Bird painting of Siskin, bird sketch of Siskin, bird drawing of Siskin, bird art of Siskin, bird illustration of Siskin. TAGS: Bird painting of Arctic Redpoll, bird sketch of Arctic Redpoll, bird drawing of Arctic Redpoll, bird art of Arctic Redpoll, bird illustration of Arctic Redpoll. Redpolls (Acanthis flammea) breed in northern Eurasia and in large parts of arctic North America. TAGS: Bird painting of Redpoll, bird sketch of Redpoll, bird drawing of Redpoll, bird art of Redpoll, bird illustration of Redpoll. Trumpeter Finch (Rhodopechys githaginea) is a small passerine bird belonging to the family finches. It breeds in the Canary Islands, in North Africa, Middle East and Central Asia. TAGS: Bird painting of Trumpeter Finch, bird sketch of Trumpeter Finch, bird drawing of Trumpeter Finch, bird art of Trumpeter Finch, bird illustration of Trumpeter Finch. The Atlantic Canary (Serinus canaria) is known worldwide simply as wild Canary. The domestic Canary is a jailbird who descended from wild Canary that inhabit the Atlantic archipelagos of the Canary Islands, Azores and Madeira Island. It feeds primarily of seeds and plant parts and during breeding also by insects. For over 500 years, humans have domesticated this finch. It is mainly the song that has made ​​the canary so popular as pets. The chaffinch (Fringilla coelebs) is very common in Europe and the most numerous finch in western Europe. Its range extends into western Asia, northwestern Africa, the Canary Islands and Madeira. . The chestnut munia (Lonchura atricapilla), formerly considered as a subspecies of the tricoloured munia, is also known as black-headed munia.It is a small passerine bird. This estrildid finch is a resident breeding bird in Bangladesh, Brunei, Cambodia, China, India, Indonesia, Laos, Malaysia, Burma, Nepal, Philippines, Singapore, Taiwan, Thailand, Vietnam and Hawaii. The Rosefinch (Carpodacus erythrinus) has the largest population distribution in all Siberia and Central Asia, but has recently migrated to Eastern Europe, Central Europe, and Scandinavia. The European serin, or just serin, (Serinus serinus) breeds across southern and central Europe and north Africa. 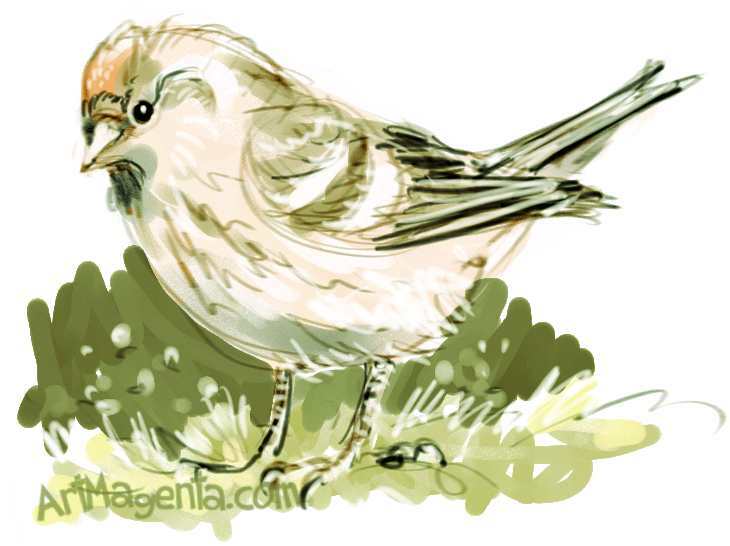 TAGS: Bird painting of European serin, bird sketch of European serin, bird drawing of European serin, bird art of European serin, bird illustration of European serin. The twite (Linaria flavirostris) breeds in northern Europe and across central Asia. The red crossbill (Loxia curvirostra) breeds in the spruce forests of North America, as well as Europe and Asia. TAGS: Bird painting of Red crossbill, bird sketch of Red crossbill, bird drawing of Red crossbill, bird art of Red crossbill, bird illustration of Red crossbill. The Goldfinch (Carduelis carduelis) is widespread throughout most of Europe including the British Isles. The bird is particularly common in the Mediterranean. TAGS: Bird painting of Goldfinch, bird sketch of Goldfinch, bird drawing of Goldfinch, bird art of Goldfinch, bird illustration of Goldfinch. The purple finch (Haemorhous purpureus)is fond in mixed forest in Canada and the northeastern United States, as well as various wooded areas along the U.S. Pacific coast. The white-breasted nigrita (Nigrita fusconotus) is a common species of estrildid finch found in Africa. The Pine Grossbeak (pinicola enucleator) is a resident bird, who like cross-beaks vary greatly in color depending on age and gender. The Pine Grossbeak has a circumpolar distribution in the north of the northern hemisphere, occurs in pine forests in Alaska, the mountains of western United States, Canada, subarctic Fennoscandia, Siberia and in high mountain areas in Hokkaido. TAGS: Bird painting of Pine Grosbeak, bird sketch of Pine Grosbeak, bird drawing of Pine Grosbeak, bird art of Pine Grosbeak, bird illustration of Pine Grosbeak. The Hawfinch (Coccothraustes coccothraustes) is a big finch with very strong beak. The Hawfinch is nesting in large parts of Europe and temperate parts of Asia. The northern populations are migratory birds, while the southern is sedentary. The Bullfinch (Pyrrhula pyrrhula) breeds across temperate Europe and Asia. The Bullfinch is mostly resident. 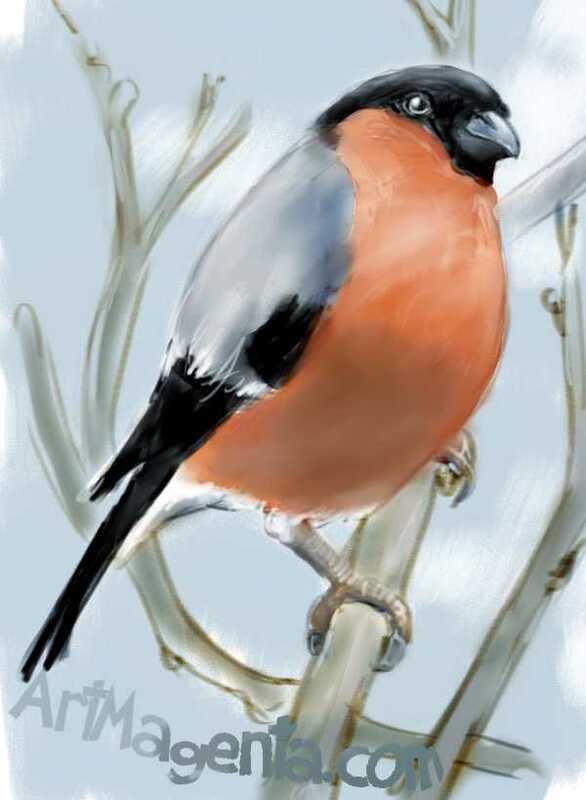 TAGS: Bird painting of Bullfinch, bird sketch of Bullfinch, bird drawing of Bullfinch, bird art of Bullfinch, bird illustration of Bullfinch.